Reese Kennedy was my mother’s older brother. He was an artist. He was a complex, soft-spoken man, but there was a richness and generosity in that complexity. He was kind and gentle, and loved his family very much. I’ve written the story of convincing Uncle Reese to draw a Texas Longhorn for me when I was five. What I didn’t tell was how that ink and chalk drawing later disappeared. I assumed that it was lost or accidentally tossed when my parents moved several years after I graduated from college. I would think of it often, but eventually gave up on ever seeing it again. I was sad that this icon from childhood was lost and possibly destroyed. While attending Reese’s funeral, I thought again about that drawing while hearing stories of those he influenced over the course of his life. Stories were shared of his work as an artist, teacher, father and friend. He had led a distinguished life personally and professionally. 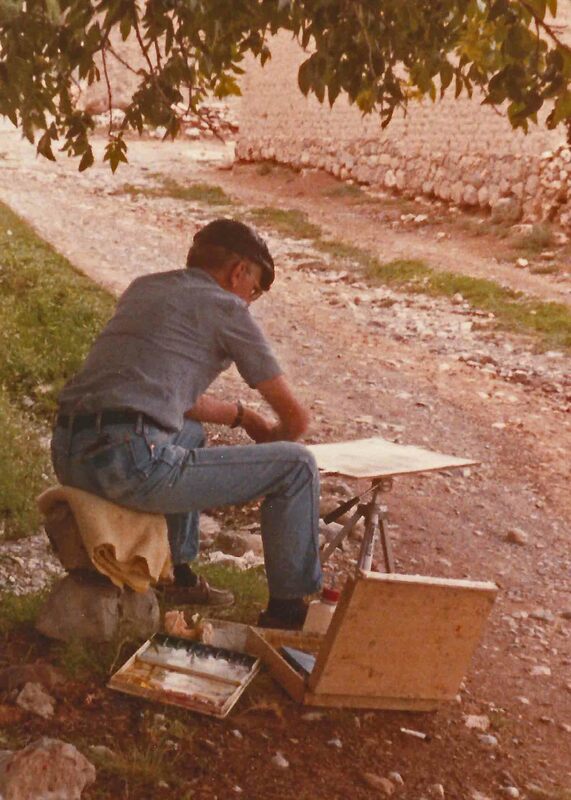 He was a founding member and first president of the Southwest Watercolor Society and taught art at Stephen F. Austin University prior to his retirement. Several years later I was helping my parents clean Aunt Lucille’s home following her death in Nacogdoches, Texas. She and Reese were both highly respected watercolor artists. While I was sorting through books, Reese’s son-in-law, Larry walked in and said, “Is this something that belongs to you?” He was holding the Texas Longhorn drawing. My parents theorized that they had given it to Reese years before, with the idea of having him make a frame for it in the frame shop of his Nacogdoches art gallery. It ended up in one of his collection folders and time passed by as it sat safely in his home. I had the drawing framed, and it is now on display in a prominent place where I see it daily, thankful for this gift from the past. Knowing Reese, he would humbly say, “If I’d realized how special this drawing was going to be to you, I would have spent more time on it.” I would reply that in dealing with me at age five, he probably needed to make that longhorn appear quickly to hold my attention. It was beautiful to me then and still is today. I posted the initial story of this drawing in January of 2014. In July, I received the following email from the feedback page of my blog. I think I have one of your uncle’s watercolors. 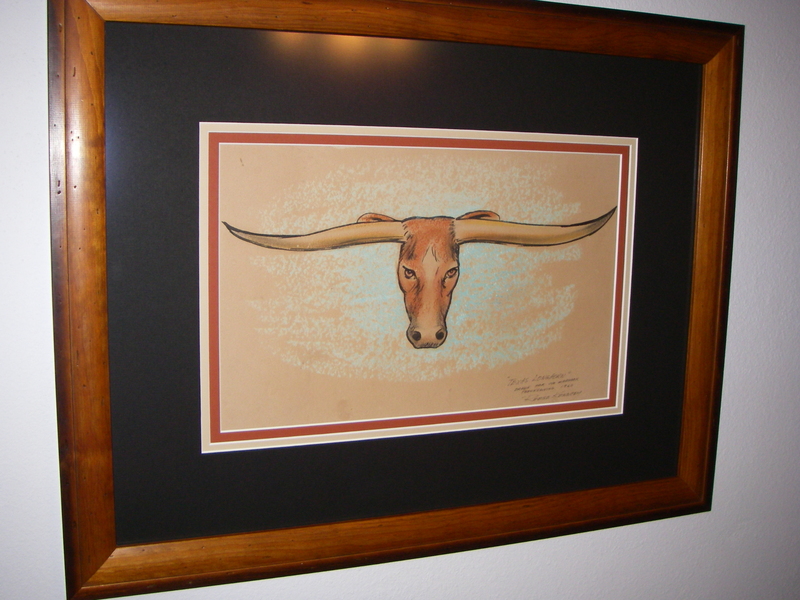 The signature matches the one on your longhorn painting. 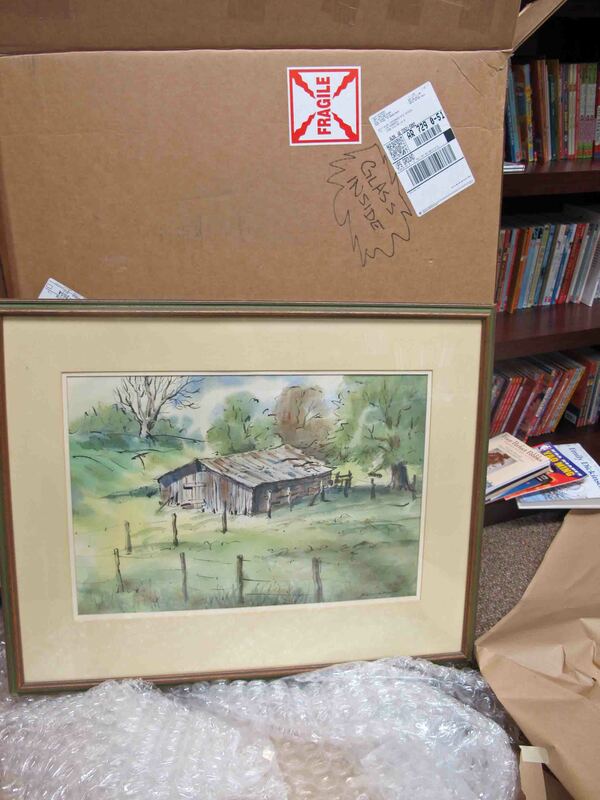 The piece I have is a watercolor of a log cabin. Would you like me to email you a photo of it for you to see? I would enjoy seeing a photo of the painting and forwarding it to Reese’s daughter. Reese was a founding member and first president of the Southwest Watercolor Society. He was a wonderful person. Scott Dressel-Martin lives in Wheat Ridge, Colorado. After visiting his web site, I realized he was a gifted professional photographer. He once worked with one of my favorite nature photographers, Galen Rowell. I was delighted that my blog entry had led me to an artist who appreciated Reese’s art. Then in August, the story continued. At long last, here is a photo of the painting I think is by your uncle. Thank you for your patience. It’s about 20×24 framed, and it’s beautiful. I keep thinking it doesn’t match anything in my house, but it’s such a lovely painting I was never able to let it go. Does this look like his work and signature to you? I was given the painting by a friend in Vail about 20 years ago as he was moving out of town. I’ve enjoyed it ever since. That’s my Uncle Reese for sure! That is a beautiful painting. 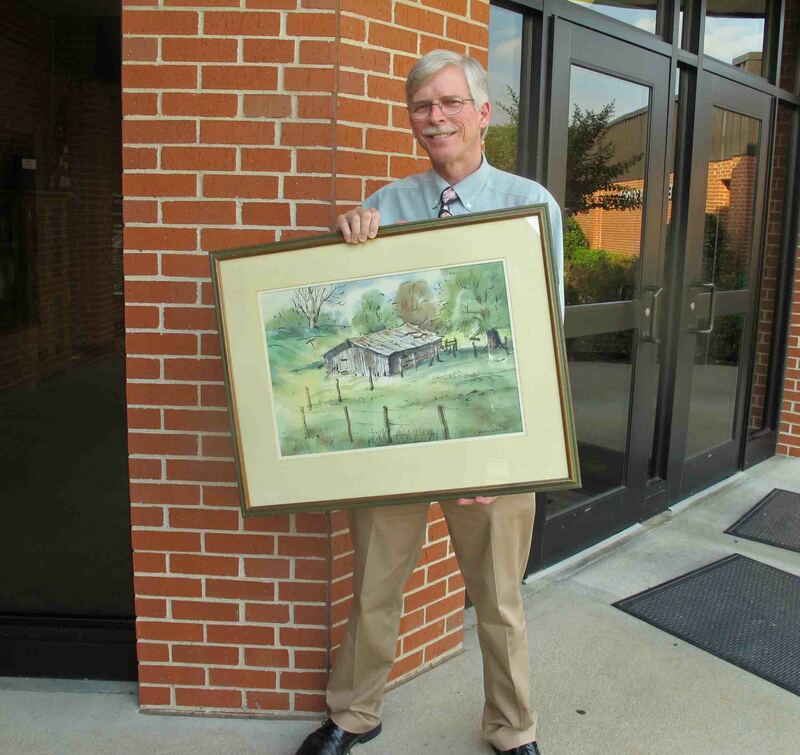 He once drove up scenic Hwy 7 through Arkansas, stopping to paint and photograph old barns and structures. Could have been that this old barn was from one of those trips. Or, it might have been a scene from East Texas. Thanks for sharing the photo. The next message from Scott was a complete surprise. Now that we’ve determined that this is your Uncle’s work I’d like to make you an offer. If you’d be willing to pay for the shipping I’d be happy to give you the painting. I love the piece but it truly doesn’t fit in our home decor. It would make my wife and I very happy to know the work is being appreciated and cherished by someone that has a connection to it. It would feel like the piece is going home in a way. Wow! Must say you’ve brought a tear to my eye with your kind offer. I would be delighted to have this painting and would treasure it for years to come. Just let me know the cost after you ship and I’ll gladly reimburse you to your Garland St. address. I will also make a donation to the David Kennedy Music Scholarship fund in appreciation for your gift to me. David, a gifted classical guitarist, was Reese’s son pursuing a doctorate in music performance from North Texas State University in the 1980s when he died in his early 30s. Reese’s daughter, Carol, has applied any sales of his paintings to the scholarship fund over the years. Excellent!! I will have the painting shipped in the next week and let you know when it’s on the way. It is wonderful to know that we are playing a small part in helping the scholarship fund. Music and theater are important to us and helping students in need is always a worthy endeavor. I can’t wait for you to have this painting! And so, this is how another painting by Reese Kennedy came into my possession. It is perfect for my office and even ties in with our school colors of green and gold. I look at this painting and think of Reese’s brushes shaping every inch as he sat behind his easel along Highway 7 or somewhere in an East Texas field. Reese was an artist. He couldn’t help but paint, but I wonder if he had any inkling of the paths some of his art would travel? That one of his drawings would be “lost” then found and cherished years later. I think he would be pleased to know that his work would be treasured and shared for years into the future. I enjoyed showing Reese’s painting to co-workers and sharing the story behind that big box in the office. The painting was shipped with care. After seeing this photo, Carol (Reese’s daughter) said this is what Reese called called “ink and wash” technique — some drawing with india ink (often with a quill) and when the ink dried, he would add the watercolor washes. By ozarkmountainhiker in Uncategorized on September 28, 2014 . Great story Jim! Thanks for sharing this with me, and thanks for the donation to the David Kennedy guitar memorial at SFA. I will let you know the next time we have a concert in David’s name. I very much enjoyed the Kennedy’s friendship over the years. Highly sensitive artistic family.